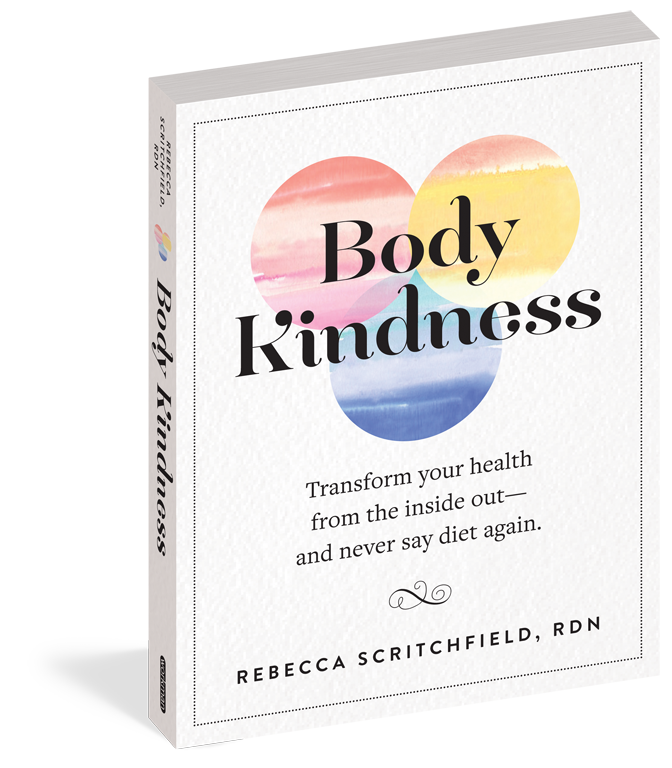 We all know the voice of the “inner critic” where nothing is ever good enough and you’re on high alert about… well, most everything. The job of the critic voice (which is not YOU) is to keep you worried and afraid. Anita Johnston thinks worrying is a good use of imagination because it brings transformational change. 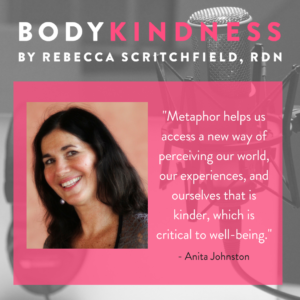 A pioneer of the use of metaphor in helping people heal, Anita discusses how you can acknowledge your inner critic “voice” without giving her front stage permission to rule your life and all the choices you make around food, exercise, and body. 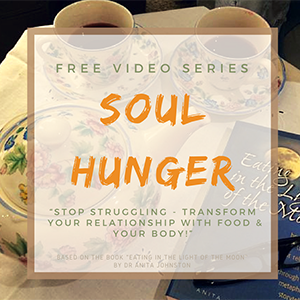 Anita shares an activity from her Light of the Moon Cafe course on “creating the inner mother.” Tune in to practice this activity yourself and get several of her metaphorical lessons that have helped me over the years and embrace them as part of your Body Kindness transformation, including my all-time favorite “The Log”. Plus, you’ll get a story about my surprise dinner with Anita way back in the day when I was just coming out of dieting and how watching her eat a steak really helped me. 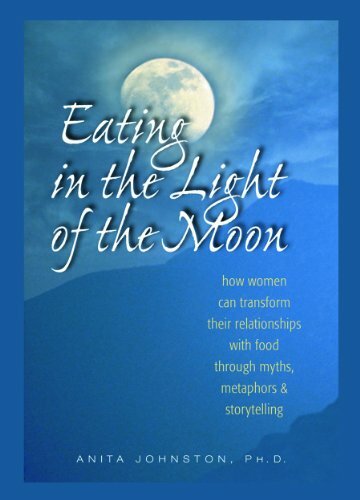 Anita Johnston, Ph.D., is a Depth Psychologist, storyteller, and author of Eating in the Light of the Moon: How Women Can Transform Their Relationships with Food Through Myth, Metaphor, and Storytelling, which has been published in six languages along with numerous book chapters and articles in professional journals. She has been working in the field of women’s issues for over 35 years and is currently the Clinical Director of ‘Ai Pono Hawaii which has outpatient eating disorder programs in Honolulu, the Big Island of Hawaii, and a residential treatment program in Maui. 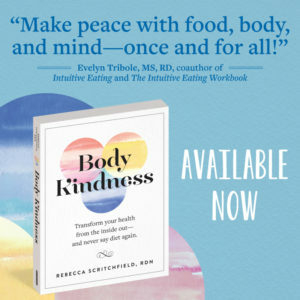 She is the co-creator of the Light of the Moon Café, an interactive e-course, women’s circle, and online “workbook” for Eating in the Light of the Moon. Dr. Johnston provides individual consultations via teleconferencing and lectures around the world to professional organizations, conferences, universities, medical institutions, and the community at large. 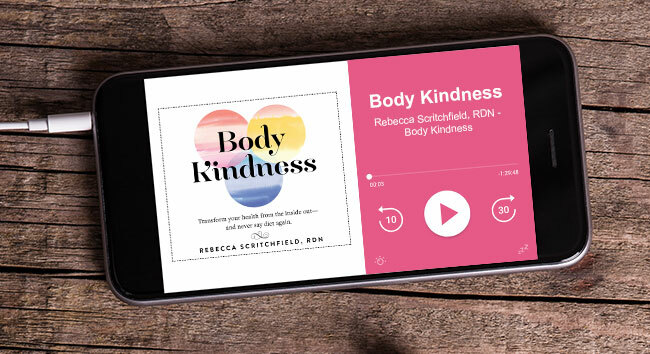 She is best known for integrating metaphor and storytelling into her training as a clinical psychologist to explain the complex issues that underlie struggles with eating, weight, and body image.